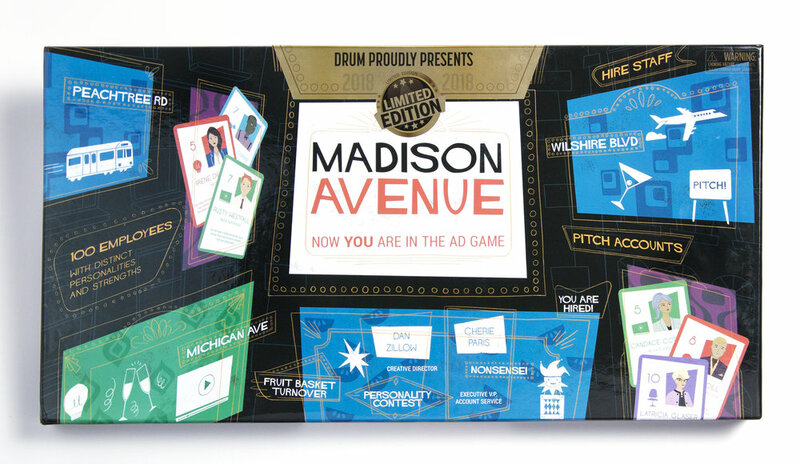 Madison Avenue is the first ever board game based on the advertising industry. Players take on roles as ad agencies, and complete tasks include hiring staff, winning pitches, gaining clients, while dodging all the mishaps that comes along. The gameplay is designed by a veteran advertising executive and the visuals and promo materials are designed by me, with creative directions from Michael Cruz. The game is released by Drum Agency in 2018. The project includes designs of the game logo, the top and bottom of the game box, the game board, 100 staff cards each featuring a different character, 50 client cards, 26 nonsense cards, busy boxes, a spinner, a 10-page rule book, and the tray that sits inside the game box holding all the game pieces. I also designed and animated a promo video and a game rules explanation video. 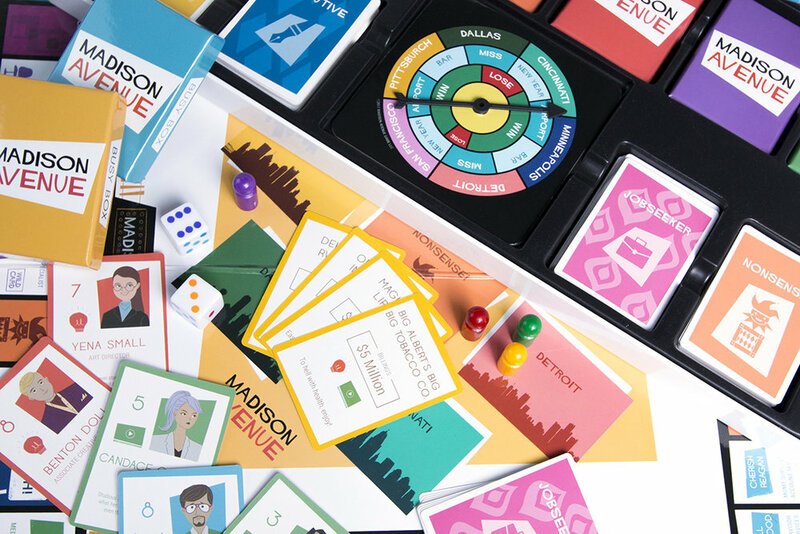 The top of game box incorporates retro designs from the Mad Men era and sets the tone for the fabulous and fast-paced world of advertising. 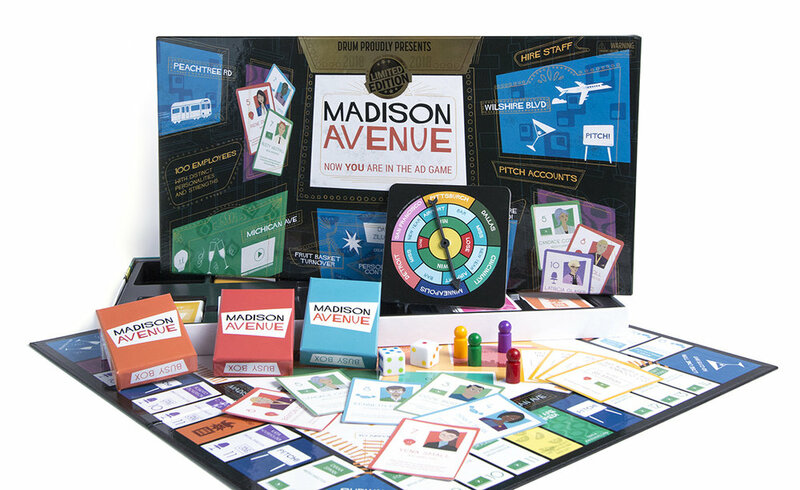 It calls out some of the key aspects of the game, as well as the cities in which the fictional ad agencies are based in - New York, Los Angeles, Chicago, and Atlanta. There are a total of 100 staff cards, including 24 executive cards and 76 jobseeker cards. Each card features a distinct character with a back story, an icon that indicates their job type (media, creative, accounts, or admin), and a number that indicates the character’s ability level. Executive cards and jobseeker cards are distinguished by different colors, icons, and patterns on the back. While the color on the front of the cards indicate different job types, the colors on the back of the cards indicate different types of cards. Each of the 50 client cards features the billings amount and an ad copy that desperately needs changing. The icons indicate what type of staff this client requires from your agency, and how many. The 26 nonsense cards each features an unexpected situation you may run into as an ad agency. The player has to obey exactly what nonsense cards dictates.